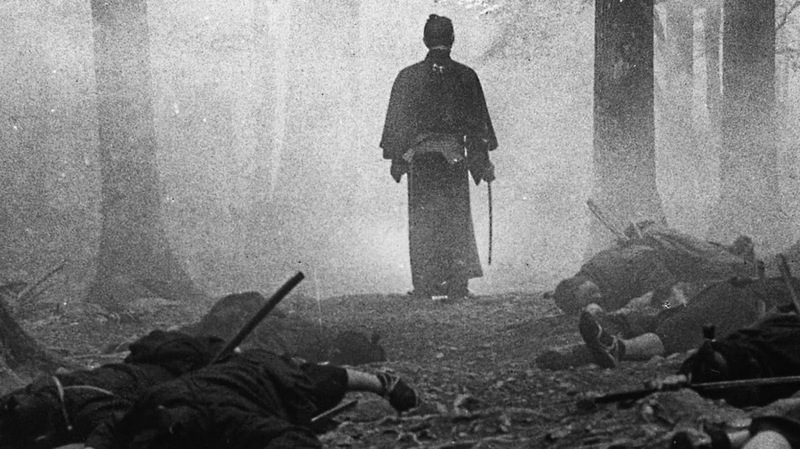 Plot: Through his unconscionable actions against others, a sociopath samurai builds a trail of vendettas that follow him closely. It's easy to admire The Sword of Doom's stylistic devices and the director's remarkable vision to make one of the most spectacular of action climaxes in Japanese cinema. It is, however, less enjoyable a process to appreciate its storytelling, which suffers an unevenness that slightly mars this swordplay action-drama classic. It is a great film in some ways, but fallible in other ways, which sums up my sentiments on this famous Kihachi Okamoto film. I say famous reservedly, and in the context of Okamoto's stature in the history of Japanese cinema. Seemingly unknown by many, and only culturally studied and revered by a minority, Okamoto lived in the shadows of his peers Kurosawa and Ichikawa, and even Kobayashi. 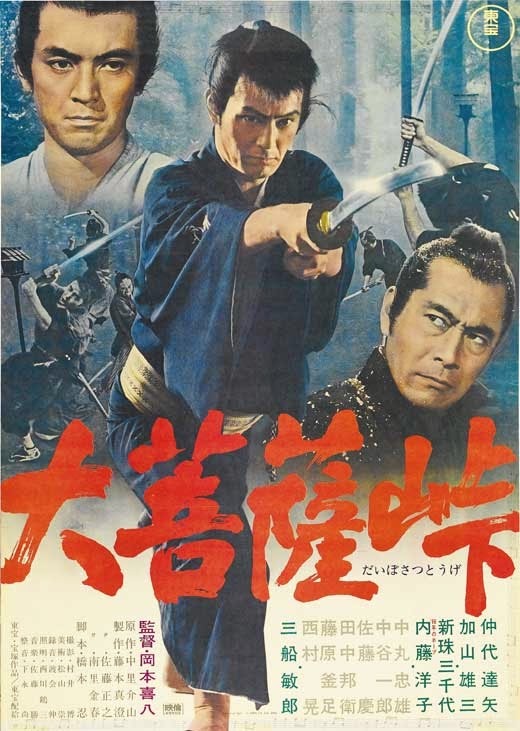 The Sword of Doom's pairing of Tatsuya Nakadai and Toshiro Mifune gives it star wattage, though without much starring presence from the latter, one of the film's unfortunate aspects. The premise seems primed to feature the duo in an ultimate showdown, but that never materializes. Nakadai plays Ryunosuke, an evil man with a sword, obviously converted to the dark side and beyond redemption or salvation. He kills without mercy; his skills brutal and cruelly efficient. 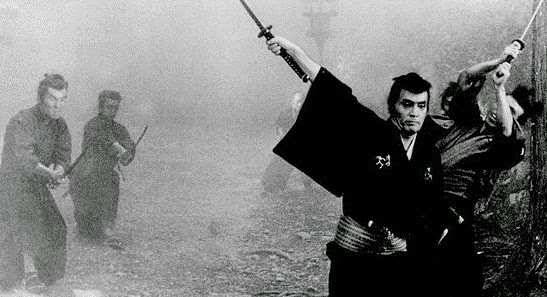 Mifune, on the other hand, plays a noble swordsman, perhaps equally skilled, who inspires his disciple to master a technique that could possibly allow the latter to avenge his brother's death in the hands of Ryunosuke. Strangely enough, we don't even get a showdown between Ryunosuke and Mifune's disciple. When the film ends with an abrupt freeze-frame ala Truffaut's The 400 Blows (1959), there's a feeling that business is unfinished. In Truffaut's film, this technique was executed superbly, capturing a fleeting, bittersweet moment of empathy and loss – where do life's unpredictabilities bring us to now? – it seemed to ask. The irony in The Sword of Doom is that Ryunosuke's fate is all but certain, surrounded by tens of warriors hell-bent in killing him. He persists, as if he is the last man standing for the flag of evil, but Okamoto never shows his deserved death. I believe he doesn't really care for a man who doesn't care. It is an unexpected way to close the film, though never quite completely satisfactory. In an already stop-start affair with unnecessary subplots left hanging, it is ultimately Nakadai's outstanding performance that singularly holds the film together for the better. Verdict: Uneven storytelling slightly mars this swordplay action-drama classic with one of the most spectacular action climaxes in Japanese cinema.